When you only read comics produced by Marvel and DC, you are almost conditioned to expect the work to function in a certain way. There’s a formula to the narrative arc, a structure to the artwork. That’s not to say that’s a bad thing. There’s a reason Marvel and DC are the big two. However, when you venture outside of their systems it can be a bit of shock. 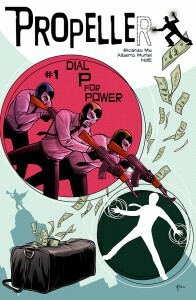 Propeller #1, from writer Ricardo Mo and artist Alberto Muriel, delivers that shock. Originally a webcomic, the first issue collects the beginning of the series and introduces readers to Rex, who—after many years of researching a German scientist forced to work with the Nazis—has stumbled onto a pair of gauntlets that give him powers. He’s kept this a secret until a bank robbery forces him into action. Now his secret is out and he must face the consequences while deciding if he is a hero or not. You won’t find a “big bad” in the first issue of Propeller. In fact, beyond the bank robbery, you will find little that shouts superhero in the story. Rex’s life is full of very real problems and decisions: making the right choices, conflicts with friends. The bulk of the book’s conflict comes out in Mo’s dynamic dialogue. It’s easy to get lost in the character’s conversations, to forget you are reading a comic because the character’s voices are so real. One of the aspects that makes Propeller great is the relationship between Rex and his friend, Hud. This isn’t your standard super hero side kick. Hud acts almost as a monitor to Rex, wanting him to suppress his powers, lecturing him on their use. But Hud is taking some risks of his own by helping Rex. The time spent with his super hero friend is taking a toll on Hud’s marriage. Another of Propeller’s strengths is Alberto Muriel’s mastery of scene. Muriel uses a number of techniques to link panels together—from movement to items—that trick the reader’s eye into believing they are watching a film. His pencil is as effective as a camera—shifting from close ups of a shower head that pull out to reveal a frustrated Rex wrapped in steam, unaware his problems are only beginning. Muriel brings a sense of movement to Propeller that is unseen in many comics. His use of black and gray also add excellent depth to each panel. Propeller is unlike anything you will find published by Marvel or DC. It’s a pleasant departure from the superhero epics those companies produce, and if you are a committed reader of the big two, after finishing Propeller you’ll want to see what else is happening in the world of indie comics. Propeller #1 is now available from Comixology.